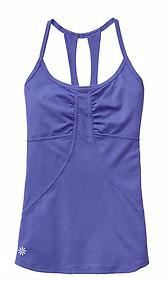 Congratulations to Pam Saunders for winning the Splits59 Sabrina Legend Singlette Tank on my blog’s latest giveaway! Pam — a fellow Pure Barre Winston-Salem studio devotee — says her favorite springtime workout activities include walking her dog Bella, catching up with friends during long neighborhood walks, and Pure Barre (“such a feel good rush after the class,” she says, and I must agree). Congrats, Pam! I’ll be contacting you with details on how to claim your adorable prize.